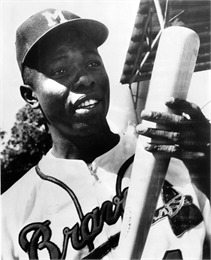 In this exhibit explore the artifacts and memorabilia of the Braves during their time in Milwaukee from 1953 to 1965. Discover how the arrival of the Braves in Milwaukee in the spring of 1953 signaled a new era in baseball history. Learn how the team, led by young sluggers and powerful pitchers, became perennial National League contenders, finishing lower than second only once between 1953 and 1960. See highlights from the 1957 World Series, when the Milwaukee Braves beat the New York Yankees four games to three, and the next year when the two teams went head to head again in the 1958 World Series.